For a Daily Dose of Drupal episode that covers this blog post topic as well, take a look at Drupal 7 Ajax Framework Link Example. After struggling to find documentation on how to take advantage of the Drupal Ajax Framework with just a simple HTML link I decided to provide an example to anyone else who might be struggling with the same problem. The documentation on drupal.org is very detailed, however most of the documentation centers around using the Drupal 7 Ajax Framework with forms. In this case I just want to use the Drupal 7 Ajax Framework with a simple link. 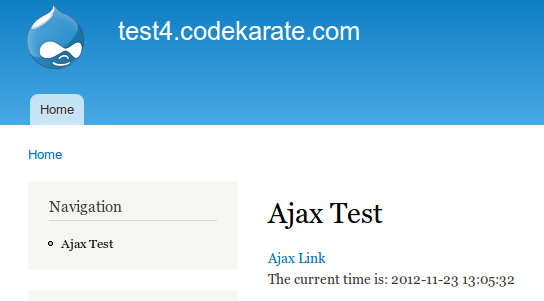 name = "Ajax Link Test"
description = "A simple Ajax link example"
The next step is to create the ajax_link.module file. In this module file we start with the hook_menu implementation. We will first just create the hook_menu implementation for a very simple page. Next we create the page callback for our hook_menu implementation. This page just displays a simple link that will load additional HTML to the page using Ajax when clicked. * Callback function that displays a simple Ajax powered link. Now we save everything, clear the cache and take a look at the page. * Ajax callback to display the current time. // Do any database queries, processing, etc. 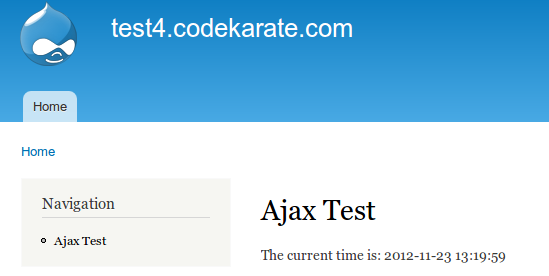 // Ajax command to replace the #ajax-display element with the current time. // Add a visual "changed" marker to the '#ajax-display' element. // encapsulated in a render array structure. // No ajax, just display the time on a page using renderable array. We now have everything we need for a simple example. The comments in the code examples should help explain what is going on. Lets look at a screenshot of what it looks like after the link is clicked. The last step is to add the ajax_command_invoke function call to our Ajax callback in our module file. // Trigger our ajax_link jQuery plugin. Let me know if you have other ways of doing something like this in the comments below.